As it’s just a few days past Mother’s day, this blog has a parenting theme. Corny as it sounds, beech parents care for their children, and grow old surrounded by their families. 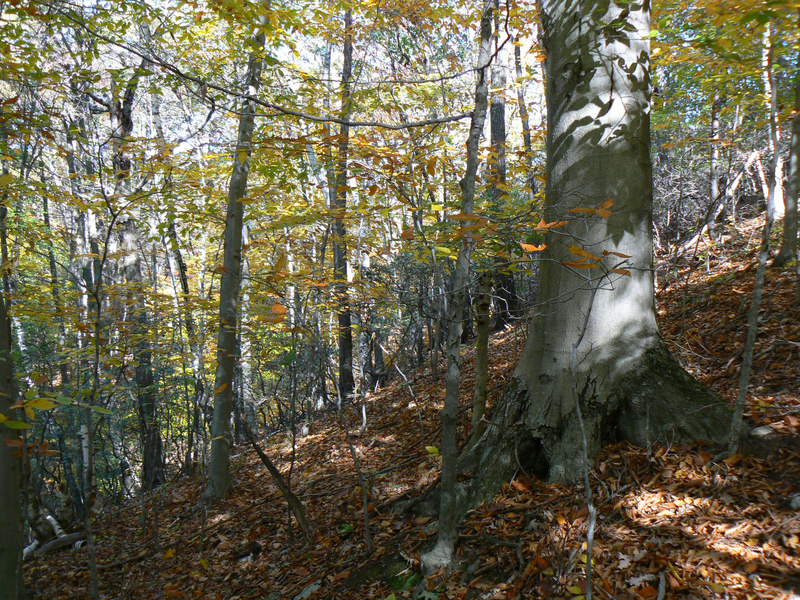 American beech is one of our few full-size clonal forest trees, a good thing because beech nuts are so sought after by wildlife that very few ever germinate. In Connecticut one often comes upon a stately mature beech tree surrounded by young trees and saplings, all growing well despite the deep forest shade. The young beeches can’t make much food (photosynthate) , but their “mother” feeds them via root connections, until they are tall enough to get ample sunlight themselves. The network of shallow beech roots also excludes weedy competitors. Seedlings from oak acorns have no such parental food source. If growing in a dark forest, they must remain stunted, barely growing, maybe for decades, until a sunny gap is created when a tree dies or tips over. Only then can they take off and become a sapling and then a tree. The practical lesson here: plant seedlings of native forest trees like oaks, hickories, ashes and beeches in well-lit areas, not in deep forest shade. This entry was posted in Native Landscaping and tagged beech, competiition, forest, gap. Bookmark the permalink. Thought I remembered something about beeches being clonal. What about cherries? How does that work with the black knot? No, not cherries. I often see a dense proliferation of black cherry saplings, but have all germinated from pits pooped by birds (perhaps a whole flock of starlings gorging on cherries in a nearby tree). If a bird perches on a black knot fungus canker (even on a long dead- cherry branch), its feet may pick up some fungus spores, especially after a rain, and carry them to another branch on the same or a different tree. You’re right that systemic fungal diseases can spread via root connections in clonal species – but not black knot.